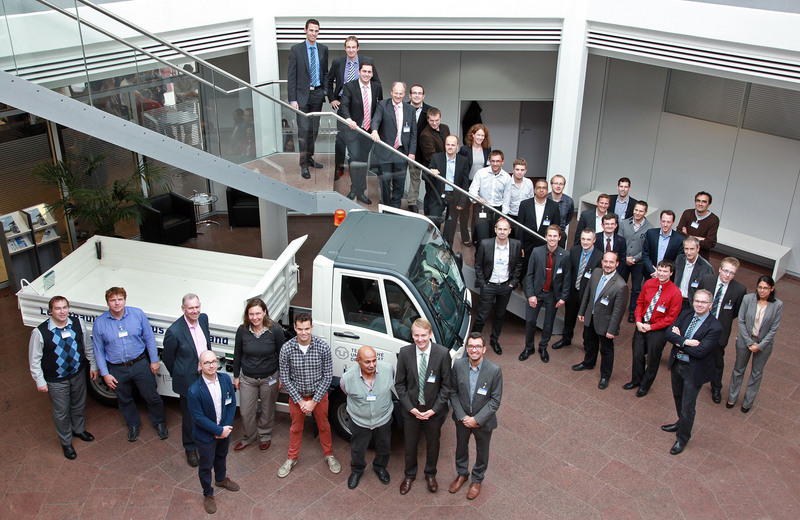 Under the direction of Infineon 30 partners from 9 European countries were researching with the aim to increase the range and reliability of electric vehicles while reducing the dependence of Asia (rare earth). In a four day final event at ZF Friedrichshafen the demonstrators from the field of electric mobility were presented to a professional audience consisting of the European Commission and automobile manufacturers. Belonging to the demonstrator’s novel Battery systems, battery monitoring and torque-sensors, angle and current sensors, and an innovative prototype of an electric motor with a multi-phase system with 9 phases were presented. The integration of engine, gearbox and inverter and the use of newly developed ferrite magnets permitted to build an engine with a reduced weight from about 15% of 90 kg to 77 kg. Furthermore, it has been possible to build the "Motor Brain" prototype without rare earths, which are currently a major cost driver for permanent magnet motors and are only available from Asia. The MotorBrain electric motor uses ferrite magnets, which are readily available and less expensive. The weaker performance of the ferrite magnets, due to the abstaining from rare earth, is compensated through the specially developed high-speed rotor of the MotorBrain electric motor. Special attention was paid to the development of the motor to functional safety, which is particularly in electric vehicles an absolute must. For this purpose, the motor controller and the battery monitoring of the sensors with safety diagnoses and control mechanisms according to the ISO26262 standard has been developed on a multicore platform, which was built on an inverter board directly to the engine. Find more information in the publications within the MotorBrain project. 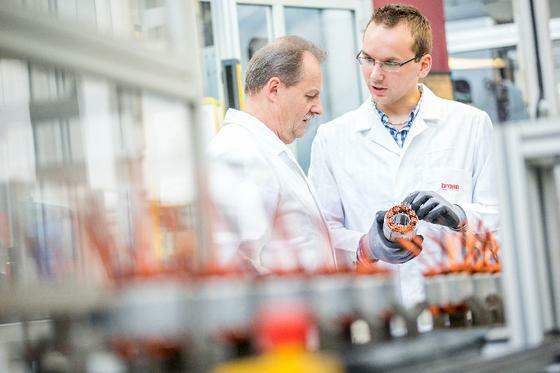 Hannover and Neubiberg, Germany – April 8, 2014 – German researchers present the prototype of an electric motor that may shape the future of electromobility: Small, light and efficient, the motor requires no rare earth metals whatsoever. 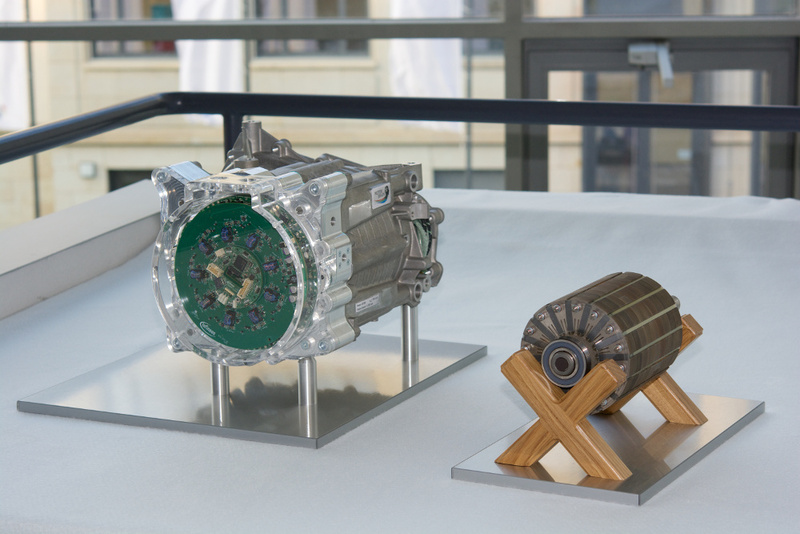 The electric motor was created and constructed by the four German partners in the European research project ”MotorBrain”: Infineon Technologies, Siemens, the Institute of Lightweight Engineering and Polymer Technology at the Technische Universität (Technical University) Dresden and ZF Friedrichshafen. The prototype is being presented at the Hannover Messe ”MobiliTec” fair stand of the German federal government (Hall 27, Stand H51). Lange Zeit galten Dysprosium und Terbium für Elektromotoren als unverzichtbar. Doch seitdem die Preise für die Hightechmetalle in die Höhe schnellten tüfteln die Hersteller an Alternativen. So erfolgreich, dass das Ziel jetzt sogar lautet, ganz auf schwere Seltene Erden zu verzichten. Magnettechnik im Wandel: Hersteller von Elektromotoren tüfteln an Alternativen zu Seltenerdmetallen. Im Bild die Fertigung des Automobilzulieferers Brose. Sustainability is a truly global trend leading carmakers in the US, Japan, Europe and China to propel electrified mobility into the mass market. This stipulates fundamental efforts in the European automotive and semiconductor industry to improve efficiency reduce weight, size and costs to stay competitive. The ENIAC JU project MotorBrain – conceived in 2011 – facilitates radical automotive innovation enabled by semiconductors. MotorBrain will not only improve the semiconductor growth rate which is usually correlated with the product growth itself but will address accelerated growth expectations coming from radical innovations. The project is driven by 32 partners among nine value chains with the contribution of two major OEMs, seven Tier1-Suppliers, major semiconductor Suppliers such as STMicroelectronics, NXP, Infineon including SME´s together with twelve academic partners. The consortium provides sustainable drive train technologies, control techniques and platforms for inherently failsafe and highly efficient Electric-Vehicle (EV) powertrains including dynamic sensors, control and more efficient and less complex battery solutions for the 3rd generation of EVs.